A rather damp 27th May 2017 (this past Saturday) saw the return of the through services between London Paddington and Pembroke Dock which form part of the summer Saturday timetable. Out filming the westbound service at Neath, I was caught in a shower and returned to the station rather soggy. Fortunately, the weather had improved by the time I reached Cardiff Central, where I filmed the first of the two eastbound services (which is formed by the stock off a Swansea to Pembroke Dock service, the westbound London to Pembroke train forming an afternoon/evening return working). 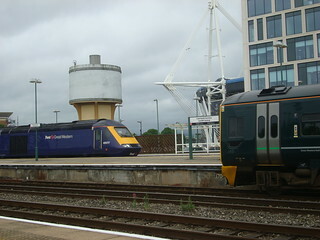 Since they are First Great Western Railway long-distance services out of Paddington, these trains are formed using 8-carriage Intercity 125 trains. They prove valuable in some weeks as the crowds of tourists travelling to and from Tenby simply would not fit on the 2-car class 150s which operate the Monday to Friday and winter services on the Pembroke & Tenby line. I hope for the railway’s sake that next Saturday (3rd June 2017) will be a quiet one in Tenby, because otherwise it is likely that there will be a lot of unhappy passengers. This is because, as station announcements were warning this week, the UEFA Champions League final is coming to Cardiff. What the announcements did not say, but the Great Western Railway journey planner website does, is that both Intercity 125 services on the Pembroke Dock branch are cancelled for that day. 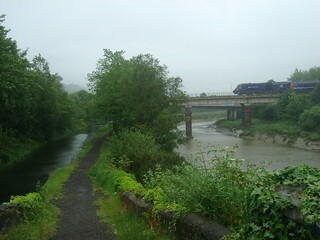 The services will be truncated to run between Swansea and London only, as they do in the winter timetable. I presume this has been done in order to free up IC125 sets to provide additional services through Cardiff which will be extremely busy due to the soccer game. According to the journey planner though, while the GWR service reverts to the winter timetable, Arriva Trains Wales is expected to run their summer Saturday service on the Pembroke Dock branch. This leaves a gap of over four hours, and another of over three hours, for the GWR services that will not be running, compared to the every-two-hours winter service. The ‘Weymouth Wizard’ summer Saturday special between Bristol and Weymouth also seems to have been removed from the schedule next weekend. Update: the Weymouth Wizard ran, slightly retimed, using hired mark 2 coaches rather than an IC125 set; as far as I’m aware the Pembroke & Tenby was left with nothing. While pulling the IC125s to provide extra capacity in Cardiff is probably a sensible move, passengers on the Pembroke Dock branch will get a raw deal. There is no mention of the change in the paper timetable booklet as far as I’m aware, so anyone who doesn’t look online might turn up for a train that doesn’t exist. The most disgraceful part of the whole affair is that, apparently, GWR are not even arranging replacement road transport to cover for their missing trains in Pembrokeshire, meaning anyone who does turn up for them will be stuck for hours waiting for the next Arriva Trains Wales unit (and, if the weather brings out the crowds, they will have to play sardines on it).